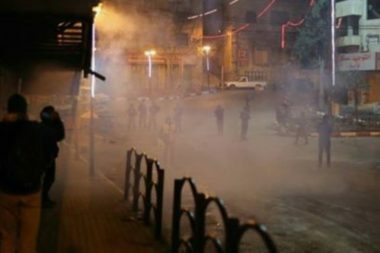 Dozens of Israeli soldiers invaded, on Wednesday at dawn, scores of Palestinian homes and shops in Deir al-Ghosoun town, north of the northern West Bank city of Tulkarem, after detonating their doors, and fired many flares, gas bombs and concussion grenades in several neighborhoods and alleys. Locals in the town said the invasion was carried out by more than 30 armored Israeli military vehicles, before the soldiers were heavily deployed in various alleys and neighborhoods. They added that the soldiers detonated the front doors of dozens of homes and stores in the town, before invading them, and initiated extensive and violent searches, leading to further destruction. The invasions targeted more than fifty homes and stores, while the soldiers also distributed leaflets warning severe punishment, including demolition of property and homes and threatening extended prison sentences against any Palestinian who provides aid to Ashraf Na’alwa. The soldiers also carried out extensive and violent searches in Bal’a and Ramin towns, east of Tulkarem, in addition to Zeita town, north of the city, including the surrounding farmlands and hills. Since Na’alwa carried out the fatal shooting in Burkan illegal colony, killing two Israelis, identified as Kim Levengrond Yehezkel, 28, from Rosh HaAyin, and Ziv Hagbi, 35, from Rishon LeZion, and fled the scene, the military started ongoing invasions into his home, and the homes of his relatives along with dozens of homes and property. The army also frequently abducted and imprisoned members of Ashraf’s family, and issued a demolition order targeting his parent’s home.